This article is about the Spanish event. For the band, see San Fermin (band). For the saint, see Fermin. The festival of San Fermín is a week-long, historically rooted celebration held annually in the city of Pamplona, Navarra, Spain. The celebrations start at noon on the sixth of July, when the party starts with the setting off the pyrotechnic chupinazo,[a] and continue until midnight, on the fourteenth of July, with the singing of the Pobre de Mí. While its most famous event is the encierro, or the running of the bulls, at 8:00 AM from July 7 to 14, the festival involves many other traditional and folkloric events. It is known locally as Sanfermines and is held in honor of Saint Fermin, the co-patron of Navarre. Its events were central to the plot of The Sun Also Rises, by Ernest Hemingway, which brought it to the general attention of English-speaking people. It has become probably the most internationally renowned fiesta in Spain. Over 1,000,000 people come to participate in this festival. Fermín is said to have been the son of a Roman of senatorial rank in Pamplona in the 3rd century, who was converted to Christianity by Saint Honestus, a disciple of Saint Saturninus. According to tradition, he was baptised by Saturninus (in Navarre also known as Saint Cernin) at the spot now known as the "Small Well of Saint Cernin"[b] Fermín was ordained a priest in Toulouse, and returned to Pamplona as its first bishop. On a later preaching voyage, Fermín was beheaded in Amiens, France; and is now considered a martyr in the Catholic Church. It is believed he died on September 25, AD 303. There is no written record of veneration of the Saint in Pamplona until the 12th century. Saint Fermín, as well as Saint Francis Xavier, are now the two patrons of Navarre. 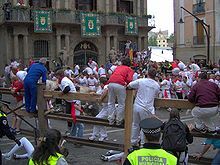 In Pamplona, Saint Fermín is now sometimes said to have met his end by being dragged through the streets with angry bulls running after him, hence the tradition. The celebration of the festival has its origin in the combination of two different medieval events. Commercial secular fairs were held at the beginning of the summer. As cattle merchants came into town with their animals, eventually bullfighting came to be organized as a part of the tradition. Specifically, they were first documented in the 14th century. On the other hand, religious ceremonies honoring the saint were held on October 10. However, in 1591 they were transferred to July 7 to take place at the same time as the fair, when Pamplona's weather is better. This is considered to be the beginning of the Sanfermines. During medieval times acts included an opening speech, musicians, tournaments, theatre, bullfights, dances or even fireworks. Bullrunning appears in 17th and 18th century chronicles together with the presence of foreigners and the first concerns about the excessive drinking and dissolute behavior during the event. Finally, the Parade of Giants[c] was created in the mid-19th century. The first official bullring was constructed in 1844. Monument to Hemingway outside the bullring in Pamplona. The worldwide fame of the modern festival, and the great number of foreign visitors it receives every year, are closely related to the description in Ernest Hemingway's book The Sun Also Rises[d] and the reports he made as a journalist. He was fascinated when he first visited in 1923, and returned many times until 1959. Hemingway was also deeply fond of bullrunnings and bullfights, but he did not participate in the running. Different city locations such as La Perla Hotel or the Iruña Café are famous in part due to the fact that the writer used to visit them. Another famous American author, James Michener, wrote extensively about the festival and bullfighting in his non-fiction book Iberia. His writing explained the art and business of bullfighting with tremendous 'gracia' by explaining the importance of 'pundonor'. The opening of the festival is marked by setting off the pyrotechnic chupinazo (or txupinazo in Basque language). The rocket is launched at 12:00 noon on July 6 from a city hall balcony with thousands of people celebrating the act in the city hall square and other locations in Pamplona. The chupinazo has officially marked the beginning of the fiesta since 1941. The person who sets it off is decided by the city mayor. Nevertheless, since 1979 tradition has been that each year after city elections the chupinazo is set off by a person from the different city council political groups beginning with the mayor and then political groups ordered by number of representatives. There have been exceptions to this tradition with some non-politicians being in charge of the act when they had performed significant achievements during the year. Examples of these exceptions were a player of the local soccer team, or the president of the "giants and big-heads" group in its 150 years anniversary. The Riau-Riau was a mass activity held on July 6. The members of the city council parade from the City Hall to a nearby chapel dedicated to Saint Fermín with participants dancing to the Astrain Waltz along the way. The ritual was introduced in 1911 by Ignacio Baleztena Ascárate. The procession was removed from the festival calendar in 1992 for the sake of public order, as political activists used the "Riau-Riau" to promote clashes with authorities. Protesting youths would often block the way and it often took up to five hours for the city councilors to walk the 500 meters to the Saint Fermin chapel. Nevertheless, in recent years it has been held unofficially without the participation of the members of the city council. In 1996 and 2012 there were two failed attempts to restore the original act with the participation of the city council, both of them being cancelled due to the violent clashes with some participants. The key day of the festival is July 7, when thousands of people accompany the 15th-century statue of Saint Fermin through the old part of Pamplona. The statue is accompanied by dancers and street entertainers, and different political and religious authorities including the city mayor. During procession a Jota (an ancient traditional dance) is performed for the saint, a rose is offered in the Saint Fernin well, and the "gigantes" (enormous wood-framed and papier-mâché puppet figures managed from inside) dance and twirl while the cathedral bell named María (Mary) peals. "El Struendo" ("The Roar"[e]) is a single day event with more than 50 years of tradition. It has been purposely left outside the official program and each year is celebrated on a different day, usually on a weekday so as to keep the crowds manageable. People gather at 11:59 pm at the Town Hall and make as much noise as possible for several hours mainly with drums but also bowls, whistles or any other objects. After nine days of partying, the people of Pamplona meet in the City Hall Plaza at midnight on July 14, singing the traditional mournful notes of the Pobre de Mí ('Poor Me'), in a candlelit ending. The city mayor closes the festival with participants lighting a candle and removing their red handkerchief as the song is played by the local band, followed by a fireworks display at the city hall. This closing ceremony tradition started out in the 1920s. The running of the bulls (In Spanish encierro or los toros de san Fermin[f]) involves hundreds of people running in front of six bulls and another six steers down an 825-meter (0.51 mile) stretch of narrow streets of a section of the old town of Pamplona. The run ends in the Pamplona's bullring taking a mean time of around 3 minutes where the bulls would be held until the afternoon's bullfight when they would be killed. Bullruns are held between July 7 and 14 and a different "encaste" (sub-breed) of bull appears each day. The event begins at 8 a.m. when a first firecracker is lit to announce the release of the bulls from their corral. Before the year 1924 it started at 6 and at 7 between 1924 and 1974. Runners gather earlier at the beginning of the itinerary to ask for the protection of the Saint by singing a chant three times before a small statue of San Fermín which has been placed in a raised niche in a wall: “To San Fermin we ask to be our patron saint and to guide us in the running of the bulls, giving to us his blessing”. A second cracker signals that the last bull has left the corral. There are six fighting bulls accompanied by six oxen (often white and brown colored) that guide them to the "plaza" and followed by three more not fighting oxen. There are also some shepherds guiding the bulls, wearing green T-shirts and holding long poles. Once all of the bulls have entered the arena, a third rocket is released while a fourth firecracker indicates that the bulls are in their bullpens and the run has concluded. After the end of the run young cows with wrapped horns[g] are released in the bullring and toss the participants, to the amusement of the crowd. The circuit has only changed slightly since 1852 as the former bullring was located close to the present one. Before that date the bullrunning ended in the "castle plaza", still not far from the present bullring. While the origin of this tradition was the necessity to move the bulls from outside the city to the bullring for the bullfight it is not clear when citizens began to run in front of them. There are written records in 1787 that the tradition was already well established with no memory of its beginning. The tradition of singing for protection to the saint dates back to 1962. The event is dangerous. Since 1925, 15 people have been killed during the event –– most recently on July 10, 2009—and every year between 200 and 300 people are injured during the run although most injuries are contusions due to falls and are not serious. Pamplona's Giants and Big-heads parade family photo. From back to front and left to right we can see the American, Asian, African and European pairs of giants (last row), the six kilikis and the 5 big-heads (second row), the zaldikos, and members of the parade who carry the figures (front row). Every day, during the morning, there is a parade of gigantes y cabezudos (English: "giants and big-heads", respectively), with the giant figures being more than 150 years old. The eight giant figures were built by Tadeo Amorena, a painter from Pamplona, in 1860, and represent four pairs of kings and queens of four different races and places (Europe, Asia, America and Africa). Their height is around 4 meters (13 ft) each, and they are carried by a dancer inside a wooden structure. During the parade, giants dance following the rhythm of traditional music. The remaining 17 figures include 6 kilikis, 5 big-heads, and 6 zaldikos, built at different times between 1860 and 1941. Kilikis and big-heads are caricaturesque, but human-like figures that are carried as helmets. Big-heads masks are up to 1 meter (3.3 ft) tall, and kilikis slightly smaller. While big-heads simply precede the giants and wave their hands at spectators, kilikis run after children, hitting them with a foam truncheon. Zaldikos, figures representing horses with their riders, also run after children with a truncheon. There are exhibitions and competitions of Basque rural sports every morning in the "Plaza de los Fueros", a square close to the city citadel, although they were formerly held in the bullring. Sports include stone lifting, wood cutting, or hay bale lifting. On the other hand, the Jai alai tournament of Sanfermin is a prestigious competition of this variety of basque pelota. It is held in one of the courts of the city. Betting is common during these events. Every afternoon from July 7 to 14 there is a bullfight in which the 6 bulls that have been driven to the bullring during the bullrunning of that day are killed. It begins at 6pm. In addition the 5th bullfight with younger bulls and not fully trained bullfighters is performed while the 6th features bullfighters on horses (in Spanish "rejoneo"). While the bullring of the city is the fourth largest in size[clarification needed] in the world, it is full every afternoon and tickets are hard to find. Every night at 23:00, a firework spectacle is held at the citadel park. Fireworks spectacles have been known to occur in Sanfermin as far back as 1595. Since the year 2000 an international fireworks contest is held. Thousands of people watch them seated on the grass around the citadel. ^ The ceremony, which dates to the beginning of the twentieth century, has been accompanied by ever-greater ceremony and is now televised all over the world. (Spanish Wikipedia:"Chupinazo"). ^ In Spanish: Comparsa de Gigantes y Cabezudos. ^ In Spanish the correct spelling would be "Estruendo", however the name of the act is intentionally misspelled. ^ In Spanish: Vaquillas enboladas. ^ a b c "History of... The saint-Saint San Fermin festival- Sanfermines-tourist information of Navarre". Government of Navarre. Retrieved July 23, 2009. ^ a b c d e f g "History of... The fiesta of San Fermín Saint San Fermin festival- Sanfermines-tourist information on Navarre". Government of Navarre. Retrieved July 29, 2009. ^ a b c "History of... Ernest Hemingway-Saint San Fermin festival- Sanfermines-tourist information on Navarre". Navarre tourist office. Retrieved July 29, 2009. ^ "The Sanfermines: the "chupinazo"". navarra.com. Archived from the original on May 18, 2009. Retrieved September 3, 2009. ^ "History of the txupinazo to 1980". Kukuxumuxu S.L. Archived from the original on July 12, 2013. Retrieved July 10, 2012. ^ "History of the txupinazo from 1979". Kukuxumuxu S.L. Archived from the original on July 12, 2013. Retrieved July 10, 2012. ^ "A "Sporty" exception to the politicians". Kukuxumuxu S.L. Archived from the original on July 12, 2013. Retrieved July 10, 2012. ^ A. Ollo (July 6, 2010). "Entrevista a Jose Mari Ganuza". Diario de Navarra. Archived from the original on January 6, 2014. Retrieved July 10, 2012. ^ a b c d e f g h M. Arrizabalaga (July 10, 2012). "Así nacieron los sanfermines". ABC (in Spanish). ^ Miren Imaz (July 7, 2012). "El Riau-Riau tendrá que esperar". Diario Vasco. Retrieved July 8, 2012. ^ "Chapel of Saint Fermin-tourist information of Navarre". Government of Navarre. Retrieved July 9, 2012. ^ "San Fermín 2012 – La Procesión" (in Spanish). Council of Pamplona. Archived from the original on June 30, 2012. Retrieved July 9, 2012. ^ "The "Struendo"". Kukuxumuxu S.L. Archived from the original on July 10, 2011. Retrieved July 10, 2012. ^ "Running of the Bulls - MySanFermin.com". ^ Michelle Tsai (July 12, 2007). "I Was Gored by a Bull. Is my life in danger?". Slate Magazine. Archived from the original on July 31, 2013. ^ Giles Tremlett (July 10, 2009). "Bull kills man at Pamplona festival". The Guardian. ^ "The Bull Run". Ayuntamiento de Pamplona (Council of Pamplona). Archived from the original on May 29, 2008. Retrieved July 21, 2008. ^ Juan José Martirena Ruíz (2001). Historias del viejo Pamplona. Pamplona: Ayuntamiento de Pamplona. ISBN 84-89590-90-7. ^ Unai Lako, Aitor Calleja (2010). Gigantes de Navarra. Pamplona: EGN. ISBN 978-84-937633-1-2. ^ a b c d "Rural Sports". Sanfermines.net. Asociación de empresarios de hostelería de Navarra (Businessmen association of hotel and bar's industry of Navarre). Retrieved September 26, 2010. ^ a b "The bulls... The corrida-San Fermin". Oficina de turismo de Navarra (Navarre tourist office). Retrieved August 25, 2010. ^ a b "Fireworks". Sanfermines.net. Asociación de empresarios de hostelería de Navarra (Businessmen association of hotel and bar's industry of Navarre). Retrieved September 26, 2010. Official guide to the fiesta of San Fermín.